In 1804 AD, the Sioux people received a visit from official representatives of the newly formed United States government. 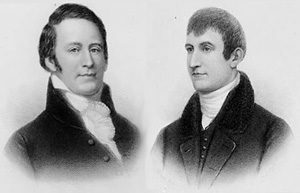 The visitors’ names were Meriwether Lewis and William Clark. Both of them had already killed many Native Americans. Mostly they had killed Shawnee. They were fighting to take Shawnee land in the Appalachians. The Sioux didn’t like these white men passing through their land. The two sides had some bitter fights before the Sioux decided to let Lewis and Clark keep going. Lewis and Clark were exploring the land the United States had bought from Napoleon in the Louisiana Purchase. They had three reasons. One reason was to see about conquering the West from the Sioux for the United States. So the Sioux were right to resist them. The second reason was to find out whether there was a river that would carry boats from the Atlantic Ocean to the Pacific Ocean without having to go all the way south around South America. (There wasn’t.) The third reason was to claim the Pacific Northwest for the United States. Lewis and Clark weren’t the first Europeans to explore the West, but they were the first official representatives of the United States. When Lewis and Clark reached the Mandan (in modern North Dakota), they got along better with them. The Mandan saw Lewis and Clark as trading partners rather than conquerors. After some months, Lewis and Clark hired a Shoshone girl, 15-year-old Sacagawea, and her French husband, Toussaint Charboneau, to show them the way. Sacagawea could help them negotiate with the Shoshone when they got there. The two agreed to go, even though Sacagawea was about to have a baby. In February 1805, Sacagawea gave birth to a baby boy, Jean Baptiste. She brought her baby along on the whole trip. With Sacagawea along, Lewis and Clark did get along better with the Shoshone people (in Idaho). With their help, the expedition crossed the Rocky Mountains into Oregon. This brought them to the Nez Perce people of the Pacific Northwest. The Nez Perce were also reassured that Lewis and Clark were peaceful because they had a woman and a baby with them. The Nez Perce were friendly too. They hoped to buy guns from Lewis and Clark. And sure enough, the Nez Perce did get guns from Lewis and Clark, in exchange for horses and canoes. Paddling their canoes down the Columbia River brought Lewis and Clark to the land of the Chinook people. The Chinook treated Lewis and Clark like the European sea traders they had already met, and were happy to sell Lewis and Clark food, though both sides also stole things from the other. The Shoshone, the Nez Perce, and the Chinook were friendly because they didn’t realize yet that the United States wanted to conquer them. On the way back, in 1806, Lewis and Clark met native people who knew better, and got into fights with both the Blackfoot and the Crow people; Lewis’ soldiers killed two Blackfoot, and the Crow took Clark’s horses. The fort that Lewis and Clark had built, Fort Mandan, mysteriously burned to the ground. All these native people made it clear that representatives of the United States were not welcome on their land, but when Lewis and Clark got back to the United States in September 1806, their trip and their maps inspired many United States citizens to want to conquer all the native people from the Atlantic to the Pacific coasts. Cite this page: Carr, K.E. 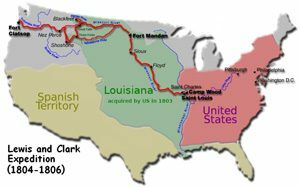 Lewis and Clark – American history. Quatr.us Study Guides, August 13, 2017. Web. April 24, 2019.